This was a good week, with the highlight being that I hit 100 miles for the month! I know lots of people have much higher mileage than that regularly, but for me this is the first time I know of that I hit 100. I've been in the 90s and just not quite gotten there in the past. My goal for this marathon is to get to 35-40 miles a week so we'll see how that goes. In the past, I was mid-20s to low-30s per week during marathon training. I believe the higher mileage will be helpful, more time on my feet. Another week highlight - I ran an awesome 5 mile with faster friends from my Ragnar team, and I was comfortable at a 9:25 pace the whole time. Hmmm. I never think I can do that, but then I bust it out at a race or with friends and feel great. Perhaps my comfort zone is faster now and I don't even realize it? I worked with this thought on my 9 mile run this week and found the same. The miles at the beginning were slow to warm up, but the last few were at 9:40 or under too. I'm super happy with this progress! We worked so hard in this sand volleyball game, but we ended up losing by just a tiny bit to a well matched team. Every point took many rallies so it was super fun and tiring. After this, I was still feeling the Dipsea Trail soreness, so I took the 2 mile recovery run easy. It felt good and was definitely what I needed to warm the muscles. 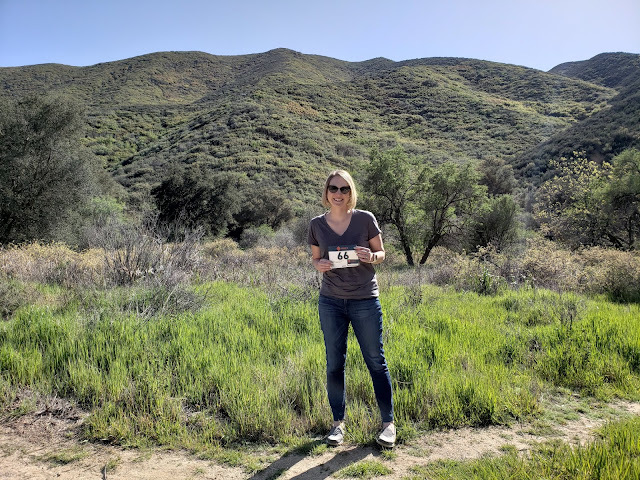 I met Alisyn to run trails in the early morning at Picchetti Open Space Preserve in Cupertino. The trails were mostly single track, scenery was great, and the weather was nice and cool. Nothing like a morning trail run to kick off the work day! We did an out and back from the gravel parking by the winery. My core class was good, similar to usual so I won't go into detail. The best part? Iron(wo)man Liza, who did Ironman Canada the Sunday before class, was already back to teach us! I loved talking to her about the experience and am forever inspired by her. She finished in 10:34 and qualified for Kona. Look, I'm reflective. And running in the dark. Running with friends Julie and Eddie was great because they are faster than me, and we met in the middle. We averaged 9:25/mile for the 5 mile run, and I was so happy with this! I was able to talk the whole time and felt good, which tells me I don't push pace hard enough on my own. I'm learning this the more I run with others lately, and I'm working on it. This was a great sand volleyball day, 3 games total and a win for my team! It was a great workout in the sand. I took the rest of the day easy. Another tough sand volleyball game, but another heartbreaking close loss. Oh well! We played about the best we ever have together. I did my 9 mile run this day because I knew I'd be volunteering for a long time on Saturday. It really was perfect outside, cool and breezy. I started slow to warm up tight calves, but I ran the last few miles faster than my normal longer run pace of 10:30. If only I hadn't walked a little to stretch out the calves in mile 2 (split 11:33) and to take shot bloks in mile 4 (split 10:37) this would have been an average pace under 10 for sure. As it was, I averaged 10:01 pace. This was my best 9 mile run to date and it didn't feel hard either. I volunteered for a trail race this day. More on that in another post to come. 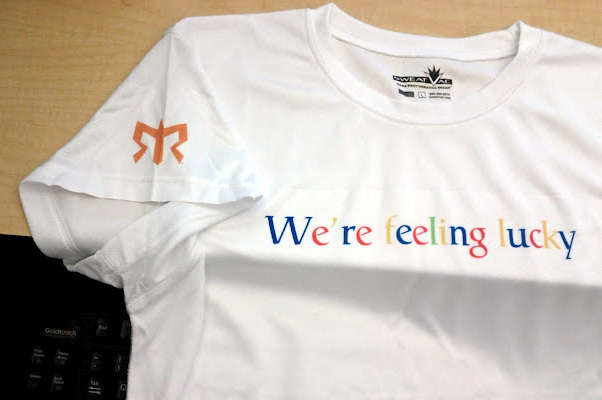 In other news, our Ragnar team shirts came in this week and they look great! I love the little Ragnar logo on the sleeve. Our team name is 'We're Feeling Lucky'. Most of the team is from work, plus 2 additional people. We've had fun at team lunches and the night run, and I'm geting really excited for the race now. I bet you are definitely capable of faster times than you think. Especially if you could pull off the faster pace AND talk. Maybe it just takes a good distraction to take your mind off the effort. Thanks! Yeah - just gotta get out of my comfort zone and make my comfort zone faster. I still get that 'be cautious so you finish' mentality at times. Great pace progress! I have found that the more I have spent extra time on my feet, my pace just naturally becomes faster. And also, it was great to read about your awesome training week. I needed to see that from someone after I had a crappy training week. I hope this week is better for you! Sounds like a great week/month! Love the shirts and the shiny reflectors :) With school starting, I might need to breakdown and buy a headlamp and some reflective clothes. 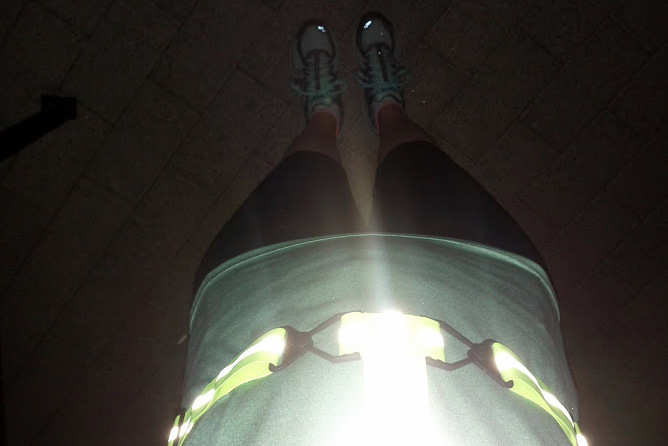 I'm just so freaked out to run in the dark but it will be good training for Wine and Dine. I actually loved it, I was freaked out too. That said I was with 2 other people. I used to run in the dark when I lived in Ann Arbor, but I tended to stay on main roads with street lights. It's an amphipod xinglet reflective vest!